One year to the day after the Global Positioning System constellation began a modernization effort to improve the accuracy of the navigation network, the next step in that upgrade blasted into space from Cape Canaveral, Florida. The GPS 2R-15 satellite rode a three-stage Boeing Delta 2 rocket off launch pad 17A at 2:50 p.m. EDT (1850 GMT) Monday. About 68 minutes later over Guam, the 4,500-pound craft was successfully released. "The Delta team has launched all the GPS 2 (-series) spacecraft and we look forward to continuing with the delivery of the replenishment satellites to keep the constellation operable 24-7," said Dan Collins, vice president of Boeing Launch Systems. Controllers will spend the next three weeks guiding the new satellite into the GPS network circling 11,000 miles above Earth and testing its onboard systems before declaring the Lockheed Martin-built craft operational. The GPS constellation features 24 primary and several backup satellites flying in six orbital groupings. The Air Force began launching the fleet in 1989 and continues to send up new satellites to keep the navigation system in good health. There are 29 operational GPS satellites in the system. 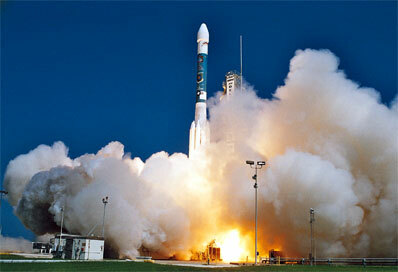 GPS 2R-15 will assume the Plane A, Slot 2 position, taking over for the GPS 2-12 craft launched in February 1992. The aging satellite, which has long surpassed its expected life span, is showing symptoms of failure in its internal clock system. To get the last bit of usefulness out of the old satellite, controllers plan to relocate it to the A4 slot within the GPS constellation to act as a backup for another craft. GPS satellites send continuous navigation signals that allow users around the world to find their position in latitude, longitude and altitude and determine time. "GPS has been a key enabler of transforming warfare from the days of World War II when we measured the ability to destroy a target in how many sorties we'd have to fly, how many bombs we'd have to drop and how many pilots' lives we'd have to put at risk. Today, that balance has changed to now a single sortie with a number of weapons can actually take out multiple targets given the precision that is enabled largely due to GPS," said Col. Allan Ballenger, commander of the Global Positioning System Wing. "But it doesn't stop there because GPS also helps save lives by being able to couple that precision warfare and not having to do things like carpet-bombing of decades ago. We can pin-point what the true military target is and not have to interfere with the additional collateral damage and spill over into other areas." The $75 million satellite launched Monday is the second with modernized features that will transmit additional signals for military and civilian users, promising greater accuracy, added resistance to interference and enhanced performance. The advancements will provide the military with a more robust jam-resistant signal and enable better targeting of GPS-guided weapons in hostile environments. The new civilian signal removes navigation errors caused by the Earth's ionosphere. "By launching just one or two, that does not give an immediate full operational benefit. But it starts us down the path," Ballenger said. "The more satellites we populate into the constellation, the greater the benefit." Lockheed Martin has built 21 of the current generation GPS Block 2R spacecraft for the Air Force, with Monday marking the 15th launch since 1997. The first with added modernization updates was successfully deployed a year ago. The next is scheduled for liftoff November 14, and Ballenger said the launch rate will be increasing. But he said officials must balance between deploying the newer satellites while getting the full use out of the older ones in space that have operated far longer than expected. "This is really a testament to the men and women of really decades ago who did the original design work and building of the satellites that have proven on-orbit that they have exceeded their original design life, typically, by about double. The satellites originally had a design life of the 6-7.5 year time frame and our oldest one on-orbit is about to come up on its 16th birthday next month. That is quite an achievement and it's still cranking out great navigation signals for users," Ballenger said. "The good news is the satellites are living longer. What that has meant is the taxpayers get the benefit of being able to delay launches and delay satellite procurements and things like that accordingly. But we continuously update our reliability models and assess what is the right time table to launch, what is the right time table to procure satellites. That is something we update all of our analysis at least twice a year on and keep a very tight handle on. "As we look at the overall age of the constellation, typically you would want to have some that are very young, some that are very old and some that are kind of right in the middle, and you'd like the average to be close to the mid-point of what you would expect out of all of the satellites. Overall, the constellation right now has some (tilt) toward the older side. So we are looking forward to launching a bit more aggressively."